Missionary Arlyn Van Enns remembers two young brothers who listened intently to his late wife Annette’s Bible stories at Family Camp. Sometime later the boys moved away and the Van Ennses knew that there was little if any Christian encouragement where they went. Would what the brothers experienced at Bible camp make a difference? Carolyn Jespersen tells of a boy who came to summer Bible camp seven years in a row. The Jespersens prayed for him of course, but after all those years the young fellow still had not indicated a commitment to Christ. Did anything he heard in all those Bible camp chapel sessions sink in? Our NCEM vision is to establish strong indigenous multiplying churches. If that’s our goal, how much of our time should we be investing in reaching children and teens? Keep reading and you’ll learn how important ministry to youth is to our missionaries … and why. Dennis & Amanda Anderson look back on their years of church planting ministry at The Pas, Manitoba. Prominent in their minds is the very first group of Sunday school students they taught. Honorary missionary, Helen Pope, knows that it takes more than children to plant a church. “They can’t be the leaders today,” she says, “but they will be the future leaders.” She and her late husband, Joe, considered their children’s ministry as laying the foundation for that. The Hills are happy to tell of youth they worked with years ago, who are now adults and actively involved in church ministry. Why is it important to reach youth? Roan & Pat Elford mention “worldview.” They note that a person’s way of viewing the world is greatly effected from childhood. Tom & Donna Cnossen have served as church planters in a number of First Nations communities. Along with that, Tom has devoted considerable time and energy as director of one of our Bible camps, Higher Challenge, taking teens on wilderness trips. Some people will question: can a child sufficiently comprehend spiritual truth? Brent & Wanda Wahlstrom serve with Tribal Trails TV, but take time to teach at Pine Ridge Bible Camp each summer. Brent wonders, “Can even adults fully comprehend the truths of God?” (described as “unsearchable” and “beyond tracing out” in Romans 11). Our missionaries mention Jesus’ words in Matthew 18: “Anyone who doesn’t receive the Kingdom of God like a child will never enter it.” In verse 6 Jesus refers to “little ones who believe.” The Gospel is meant for all of us, young or old, to believe and receive. As part of church ministry in Oxford House, Manitoba, in past years Sue Hoffman devoted much time to children and youth. “Children are more tender, and impressionable towards spiritual things,” observes Sue. Jan Sassmannshausen, who serves with Tribal Trails TV, mentions inmates who have written in. Some express remorse for not staying true to what they’d been taught as youngsters. One told of accidentally coming across Tribal Trails on TV in prison. It took him back in time to when he watched it as a child in his grandparents’ home. He now desires to change and recommit his life to Christ. Jon & Evelyn Siebert served in church planting in northern Alberta before taking on leadership in NCEM’s Bible school and field ministry. It’s not just adults who reach others with the Gospel, agrees Anita Boucher, who serves at Big River Bible Camp. She tells of children and teens becoming Christians, and then eventually their parents coming to Christ. The Bouchers have also seen youth grow into adults and lead victorious lives for Christ, even though their parents have not. 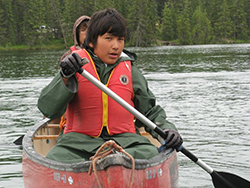 Jason Boucher tells how, in addition to ministry right at the Camp, they reach out to kids year-round on two reserves, including Whitefish First Nation, for the first time this past year. “Parents and teachers have asked for it,” he says, “and it’s great to see some of them stay to observe, and to visit with us. It might not be considered church planting work right now,” says Jason, “but we see the idea being planted in people’s hearts. Our ministry with youth is serving to initiate it. Before relocating to Prince Albert, David & Joanna Bouck served in northern Quebec. As part of their ministry they reached out to children. They presented God’s Word, and had kids memorizing it. They observed these Scriptures helping children deal with hard situations. Jon & Evelyn Siebert add how children’s ministry can open the door to adults. They know from experience, as do our other missionaries, that there isn’t always an openness from the adults to the Gospel or to the missionary. Gilbert & Laura Bekkatla assist each summer at Pine Ridge Bible Camp. 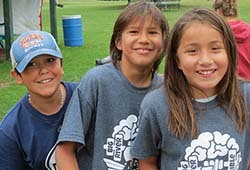 Familiar with northwestern Saskatchewan communities, they know that many of the campers come from homes where they won’t hear the Gospel. 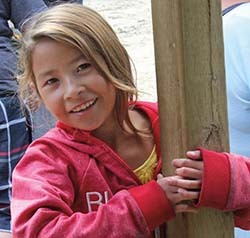 So the Bekkatlas see the need for Bible camp and other children’s ministries to help to reach these kids. 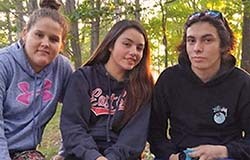 They praise the Lord for “J,” “H,” and “S” … teens who have chosen to follow Christ and are now “Leaders-in-Training” all summer at Pine Ridge, influencing other children and teens toward Christ! Missions is not just about reaching adults or reaching children … it must be both. And reaching youngsters for Christ isn’t just the missionary’s responsibility, Tom & Donna Cnossen remind us. Parents must be encouraged to teach their own children. And adults in fellowships must get involved with youth.